Dan Vitale lunges for the end zone. 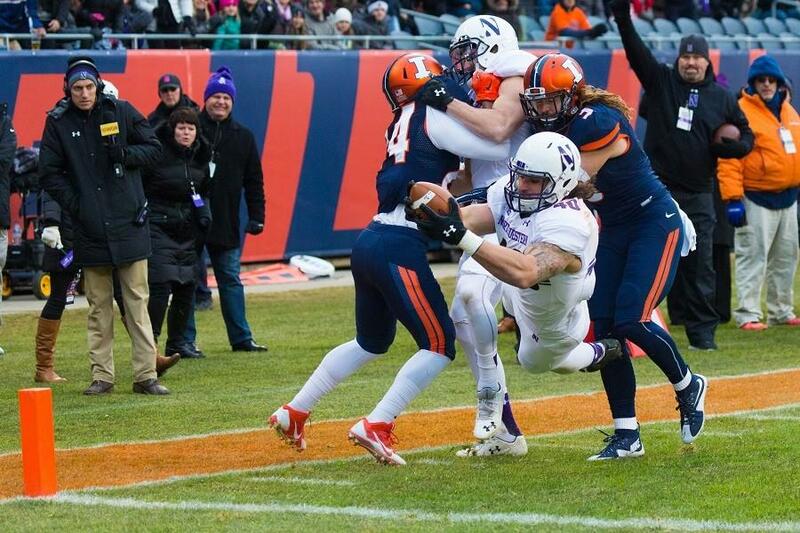 The senior superback sparked Northwestern's scoring with a 19-yard touchdown reception in the first quarter. CHICAGO — It’s been pretty, it’s been ugly and at times it has been horrific, but “Wildcat football” has found a way to prevail all season, and now Northwestern is on the verge of making history. The No. 16 Wildcats (10-2, 6-2 Big Ten) sit just one win away from setting the program record for victories in a season after dispatching Illinois (5-7, 2-6), 24-14, on Saturday. In Saturday’s contest, NU went down 7-0 early, before rallying for 21 unanswered points and taking a lead it did not relinquish. The Cats’ defense held the Fighting Illini to just 78 rushing yards on the day. This comes one week after the unit limited the Wisconsin rushing attack to -26 yards on the ground. The defense has carried the team all season, to say the least. NU boasts the conference’s fourth-best scoring defense, but third-worst scoring offense on the year, which has required the defense to maintain early, one-possession leads on countless occasions. But throughout the year, the defense has made the plays necessary to get stops and secure victories. One of the players who has consistently stepped up and done his job for the Cats is sophomore linebacker Anthony Walker. Walker leads the team in tackles on the season with 113, and with Saturday’s effort, Walker has the third most tackles for a loss in a single season in program history. Although Walker’s on-field performance has been the talk of the town, Walker credits the defense’s ability to make timely plays to the senior leadership. Senior leadership has been key on both sides of the ball this season. Although Henry, Gibson and Lowry have been tasked with setting the tone for the nation’s eleventh-ranked defense, the seniors on the offensive end have had a tougher job. With redshirt freshman Clayton Thorson starting at quarterback all season, the offense has struggled at times. Even with three consecutive touchdown drives early in Saturday’s victory, the Cats still only managed two series of 10 or more plays and went three-and-out five times. Senior superback and captain Dan Vitale, who had a 19-yard touchdown reception in the game, pointed to the experience of the senior class and how that group created a mentality that “trickled down” to the younger players on the team.